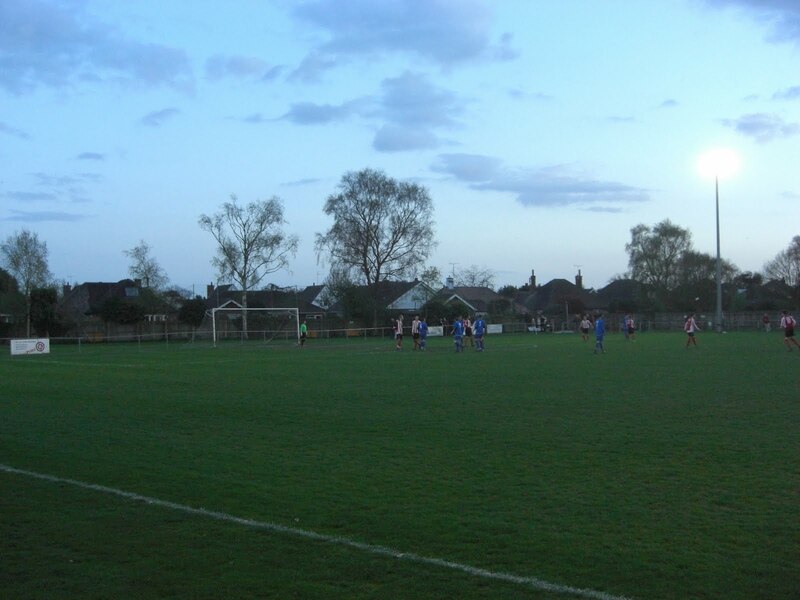 My twenty-fifth stadium of 2011 was on Tuesday 12th April 2011 at Dellwood Avenue in Felixstowe, Suffolk. The match was Felixstowe & Walton United vs. Debenham Leisure Centre in the Ridgeons Eastern Counties League Premier Division. The ground at Dellwood Avenue is less than half a mile from Felixstowe railway station with the venue sitting behind a row of houses on Dellwood Avenue itself. It is part of a larger green area and is adjacent to a cricket pitch with fencing separating the two pitches. The stadium has two stands, both on the west side of the ground. The first is a small all-seated one, able to hold around 100 people and the second is an even smaller all-standing one with raised steps to accommodate fans. As the venue backs onto a residential area and has low fences, wayward passes often ended up going over into people's gardens. One unusual feature of the venue is the collapsible floodlight pylons which are only lifted up when required, as they were for this evening game. At all other times they remain down presumably for the benefit of the surrounding houses. The east side of the ground also features two of the smallest team dugouts I can ever remember seeing. The game was a good one for the neutral as well as Felixstowe & Walton fans. Less so for any Debenham supporters present as their team was completely outplayed by the hosts. The first half was a story of missed chances for Felixstowe and they probably should've been five or six goals in front by the interval, but they had to settle for a two-nil lead. In the second half they continued to break down Debenham and scored a spectacular third before adding a fourth less than a minute later. With ten minutes remaining I had to head off in order to catch the last train home, and somehow another four goals were scored in the closing moments of the match with Felixstowe & Walton running out 6-2 winners.